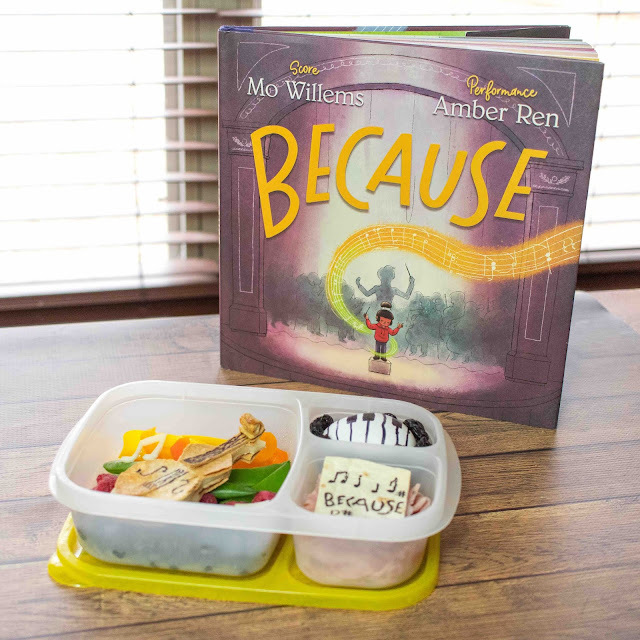 Lunchbox Dad: Mo Willems' Because Book Musical Lunch Box Recipe Ideas! 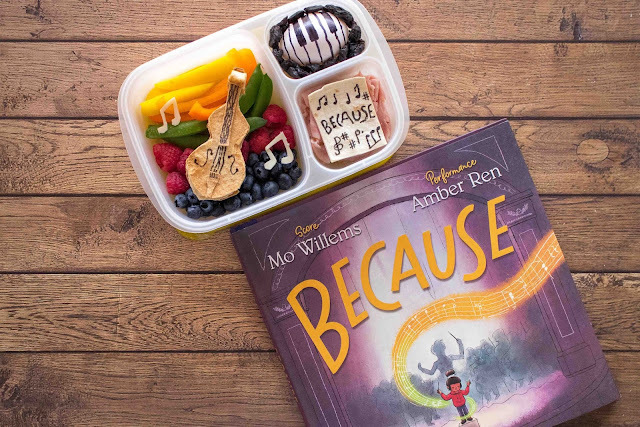 Now find out how to make this musical lunch for your kids and remind them that no matter what they do, they can play an important role in helping beautiful things come to life. Ingredients: Multiple colors of fruit and vegetables, cheese, whole wheat and flour tortilla, black food coloring, turkey, raisins, hard-boiled egg. 1. Cut the shape of the body of the violin out of whole wheat tortilla. Use that first one as a guide to cut two more out. Then use the guide to cut sliced cheese into that shape. This is optional but I also cut an extra piece for the neck of the violin, the bottom part, and the curl at the top. If desired, you can toast the pieces in the oven to crisp them up, but it's not required. 2. Stick the cheese, and one whole wheat tortilla piece in the middle of the violin. It makes something like a double decker sandwich. Draw the strings and two side "S" designs with black food coloring. 3. 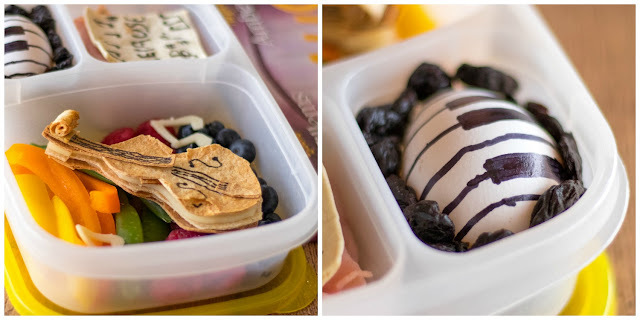 Place a rainbow of fruit and veggies in the main compartment of the lunchbox. I added this element because of the rainbow-colored music score that flows throughout the book. Place the violin on top of the rainbow. If desired you can cut music notes out of a slice of cheese and put them on the rainbow as well. 4. Draw piano keys on a hard-boiled egg. You can just use a regular marker. Put in side compartment and surround with raisins. 5. Stack turkey in a second side compartment. Draw a musical theme on a piece of flour tortilla using black food coloring. I used a food color marker. You can draw whatever you would like but I used a couple sequences of notes that I found in the book, and of course put the title "Because" on as well! Finish by giving this to your kids for lunch and reading Mo Willems' new book Because to them! With gorgeous illustrations by Amber Ren, they're sure to be enthralled. 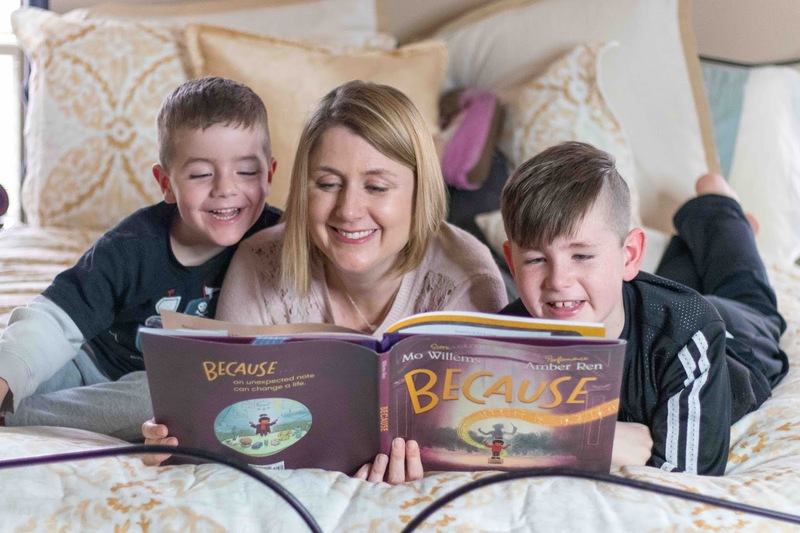 You can find the book online or at your local book store. So you should go to one of those places right now and pick it up for your family to enjoy!